Fresh. Healthy. Seriously. Support local growers. Fun. Entertainment. Breakfast. What could be bad? Farmers Market Sundays 8 to 12 Old Towne LaQuinta. Periodically after their Sunday game, my husband’s golf foursome invites “the girls” to brunch, particularly to celebrate someone’s birthday. It’s a fun way to discover new restaurants. We’re all foodies so we consider this serious research. 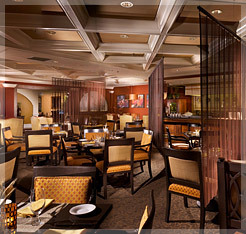 This hidden gem is nestled in the Miramonte Resort on Highway 111 in Indian Wells. Don’t be put off by their odd name, The Grove Artisan Kitchen. The food is organically delicious (they support local growers) and the setting is serene. Among the menu selections on this particular day was an artistically pleasing tuna wrap, a homemade three cheese ravoli and a deliciously juicy flank steak salad, but the outstanding selection was the unusual gazpacho. After one taste I begged our waiter to ask the Chef for the recipe. He graciously wrote down the ingredients. 1 navel orange, peeled, 4 yellow beefsteak tomatoes (hard to find), 2 yellow bell peppers, 1 cucumber, 1 Myan or Vadalia onion, garlic clove, 3/4 c good olive oil, 1/4 c Sherry vinegar, juice of 1-2 lge Meyer lemon, dash of tabasco and salt & pepper to taste. This cold soup should have some ZING. Throw all in food processor and pulse sparingly. Add 1 c french bread crumbs (optional but gives the soup umph) and . Refrigerate for several hours, then garnish with chives, diced yellow pepper and lemon or orange zest and serve with a tiny dollop of sour cream. Bravo To SMASH – You’re A Smash! Mainstream TV’s most entertaining effort in a very long time. Critics were gushing after the premier of Smash last Monday night, and for the best of reasons. This show could be the highest quality drama/musical series ever made for television. Brilliant. Finally, someone (NBC) took a chance. A risk, how novel. They have given us filet mignon, strawberries and Champagne. The characters are well drawn, the scrip sizzles and the actors/singers/dancers are top shelf Broadway. Did I mention the music and choreography? Snappy. The show oozes talent and drips with predictable “what’s gonna happen with the ingnue” but kids, that’s what it’s all about and there’s enough complexity to keep us guessing. This Jaguar of a show, with all pistons firing, throughly entertains . Talk about a cross pollination of talents, genres and media markets. Did I say it was brilliant? I’m betting it will not only mop the floor with Glee (one critic said it was “Glee for grownups”) but they’ll also create an entirely new way to feed Broadway’s hunger for new material as well. Oh so smart and clever. Take one very developed musical about a musical, let the back story evolve during the season, then take the well rehearsed cast (of the musical within the musical) and plop it on Broadway for a long and prosperous run with guaranteed adulation from the heartland — You know, when Mabel and Frank do The Big Apple for their 50th anniversary. Will this meld Broadway and television into a complely new genre? B R I L L I A N T. Katharine McPhee, Megan Hilt, Anjelica Huston, Debra Messing. Ladies. You’ve out done yourselves. Christian Borle, Jack Davenport, Jamie Cepero. Gentlemen. Nice. Of course, it’s all in the can, and we can’t see what’s ahead yet, but if the premier is any indication, we’re watching a revolution in the development of high quality entertainment and how it’s delivered and disseminated, flowing seamlessly from media to media. Instant gratification. Download the hits overnight from i-Tunes. Games – My Big Break or Finish The Lyric. Social Media, umm like me on Facebook. Katharine McPhee: Idol will be chump change when you see what’s gonna happen now. I have absolutely no doubt we’ll see it all on Broadway, soon. Then NBC can start the whole thing over with a completely new script. What a concept. What an annuity. If you can’t stay up past 10 pm, tape the damn thing. If they syndicate and sell stock, buy it. Just don’t miss it. It’s been too long since we’ve had such a joyous gift. Oh, did I tell you it was brilliant? Downton Abby is the PBS Emmy Award winning smash hit that has shattered all the records since Brideshead Revisited in 1981. First hitting the airwaves last year, DA’s season two is captivating millions of viewers. The story follows the fictional Lord & Lady Granthom, their retinue of servants and life at their ancestral home, Downton Abby – a main character in its own right. The setting is the demise of Victorian /Edwardian England – the back drop is Word War I and Socialism is creeping into a British standard of living that we’re still romanticizing. However. As so often is the case, reality is far more interesting than a chopped up fictionalized version. Being an unabashed anglophile (due to a thrilling three-year stint in the UK) I recently stumbled over a book called Lady Almina and the Real Downton Abbey. Now that’s a story! But more important, Lady Almina put more of her vast wealth to work turning Highclere Castle into a first rate hospital during World War I. She found a true calling in nursing and her single-minded determination, skill and approach to healing became a standard at that time. My mantra exactly. I have always believed woman were equal to men, but decidedly different. I had no need to burn my bra or emasculate my male friends – I just figured out what I wanted, or what was needed, and then figured out a way to get it or do it. Barriers only exist if you think they do. Lady Almina was remarkable without ever meaning to be so. Here’s a sampling – Winter (Dec 22 – March 20) 13% of men with birthdays during this period qualified as obese, but only 9% of those born in Fall (Sept 23 – Dec 21). The study also showed that people born in the Sumer (June 22 – Sept. 22) are more likely to be evening than morning types when compared to those born in Winter. Summer and spring borns, are more likely to be left handed. (I was left handed and changed…I guess that explains a few things.) People born in Spring (March 21 – June 21) tend to be taller, and this group also have an elevated risk of MS. Fall and Winter birth was associated with 53% higher odds of having a food allergy. Also, if you’re born in the Fall, you may have a longer life expectancy. I can tell you this, having used many different psychometric tools in my professional life as a human resource consultant, there is something to all of these profiles. But the one area that seems most telling – and static – is our temperament. Kiersey did a great study that has been used as the basis and it’s quite telling. We’re born with it, and it doesn’t change. So where do you fall? Click on this link and check it out – it’s a comforting way to understand your grandchildren!